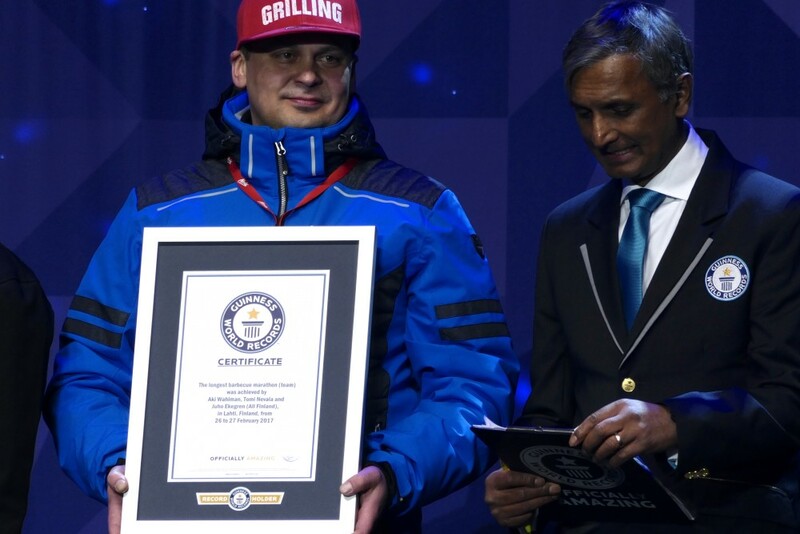 Finnish Atria set a Guinness World Record for the longest barbecue marathon lasting 36 hours. The marathon, taking place in Lahti, Finland, started on Saturday morning and ended on Sunday evening. The record was set by the professional chefs Tomi Nevala, Aki Wahlman and Juho Ekegren. 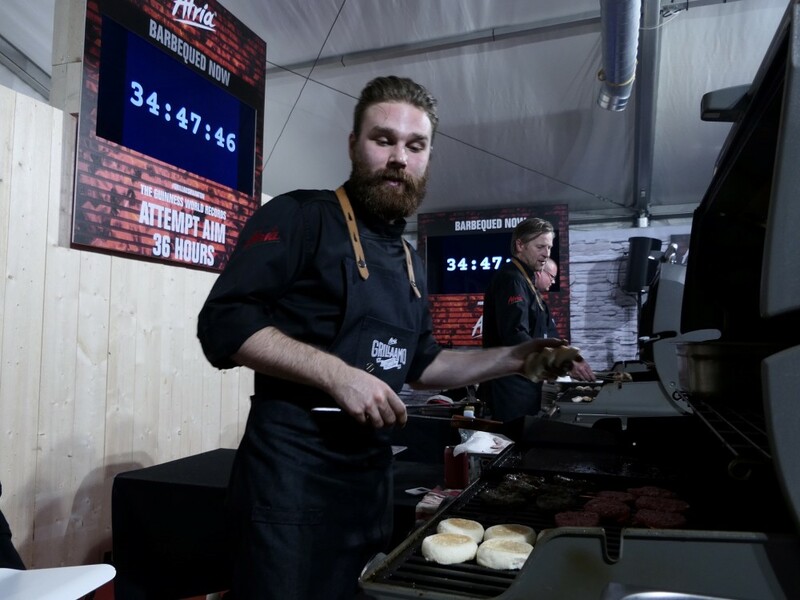 The attempt for a Guinness World Record for the longest barbecue marathon started at the Lahti marketplace on Saturday, 25th February at 7:50 a.m. and continued until 7:50 p.m. on Sunday, 26th February. The new record was exactly 36 hours, beating the previous record by an hour and 25 minutes. During the whole attempt there were two officials supervising the event. The marathon menu included mini hamburgers with parmesan mayonnaise, pork flank steaks with tomato salsa and chicken filets with melon salad. The chefs barbecued over 10,000 servings which were enjoyed by the visitors and guests of the Nordic World Ski Championships in Lahti. “With this record Atria wanted to inspire Finns to barbecue outside of the summer season. As the No. 1 barbecue brand in Finland we feel it is our duty to encourage people to have fun with cooking and barbecuing all year round. Anyone can barbecue when it is summer in Texas, but we Finns do it even when there is snow on the ground. This is a great way to complete a project of several months. Thanks to everyone involved!” says Atria’s Vice President of Marketing Pasi Luostarinen. According to Guinness rules, the barbecue team needs to be the same throughout the attempt. On the grill there has to be two items for barbecuing all the time and altogether at least five items during the attempt. Everything needs to be documented and the food has to be eaten after barbecuing. The barbecue team can eat and drink during the attempt, but they cannot stop barbecuing: there is only a five-minute break for every hour. ”It was a tough job, but in the end we reached the record in celebration of Finland’s Centennial. As expected, the most demanding moments were experienced during the early morning hours, but Lahti welcomed us warmly and we managed to keep up the spirit throughout the journey. We also want to thank the team that helped us get here, as we wouldn’t have managed to do this on our own,” Atria Chef Tomi Nevala describes the record attempt. Atria is a growing Finnish food company with an international presence. Its success is built on three pillars: food, people and tradition. Atria is one of the leading food companies in the Nordic countries, Russia and the Baltic region, with an experience spanning over 110 years. Atria’s Hiillos grilled sausage is the official sausage of the Nordic World Ski Championships in Lahti. Atria Suomi on osa kasvavaa ja kansainvälistä elintarvikealan yritystä Atria Oyj:tä. Atria on yksi johtavista ruoka-alan yrityksistä Pohjoismaissa,Venäjällä ja Baltian alueella. Konsernin liikevaihto oli vuonna 2016 noin 1 352 miljoonaa euroa, ja sen palveluksessa on keskimäärin 4 315 henkilöä. Atria Suomen tuotantolaitokset sijaitsevat Nurmossa, Kuopiossa, Kauhajoella, Forssassa, Sahalahdella ja Jyväskylässä. Atrian juuret ulottuvat vuoteen 1903,jolloin perustettiin sen vanhin omistajaosuuskunta. Atria Oyj:n osakkeet listataan Nasdaq Helsinki Oy:ssä.